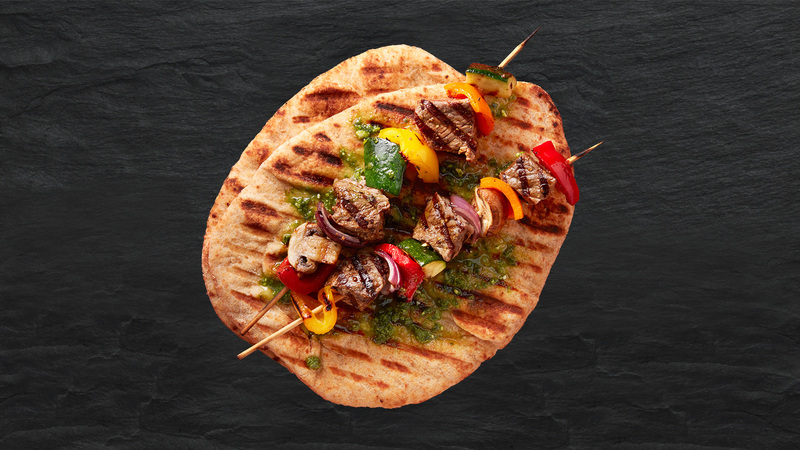 Soft and fluffy, Stonefire® Whole Grain Naan is a delicious base for grilled beef and vegetable kabobs. This dinner idea combines the flavors of our authentic Whole Grain naan recipe with grilled tenderloin beef, zucchini, peppers and mushrooms. Serving the kabobs with Whole Grain naan is a simple way to bring something wholesome to your table. Make the skewers – using 4 metal or bamboo skewers add the meat and vegetables, alternating to have even amounts. Brush with olive oil and place on preheated grill. Grill till the beef reaches desired doneness. Warm the Naan on the BBQ just before serving. Place the Naan on the plate and top with 2 skewers, drizzle with Ranch dressing.